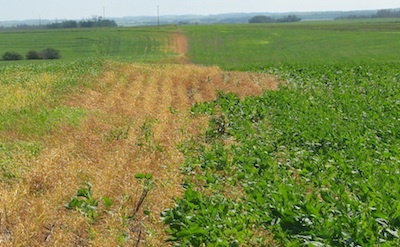 Spray drift from a canola field can be deadly to neighbouring crops. Rain and wind have delayed spray operations, leaving some very short windows to get important herbicide spraying done. Here are some drift management tips that can work in combination to help reduce the risk of drift and perhaps make those short spray windows just a little bit longer. 2. Do not spray in dead calm conditions in early morning, night or late evening. In dead calm, temperature inversions can cause fine droplets in spray to hang in the air and settle anywhere — and often not where you want them. Ground fog or dust that seems to hang in the air is a good indicator of these inversion conditions. 3. Slower ground speeds will help keep pressures down. When you increase travel speed, spray pressure must increase considerably more to maintain the spray rate per acre. For example, if you increase speed by 10%, pressure may have to increase by 25%. With conventional nozzles under higher pressure, droplet size shrinks and drift potential increases. 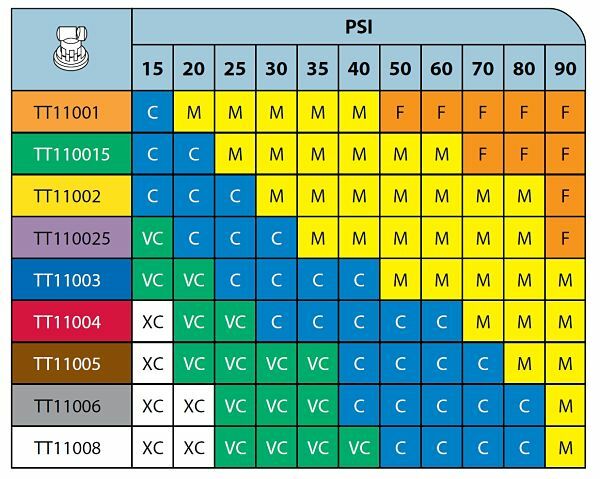 Know what speed range your nozzle provides to achieve coarse sprays. This range may be fairly narrow for high pressure nozzles. 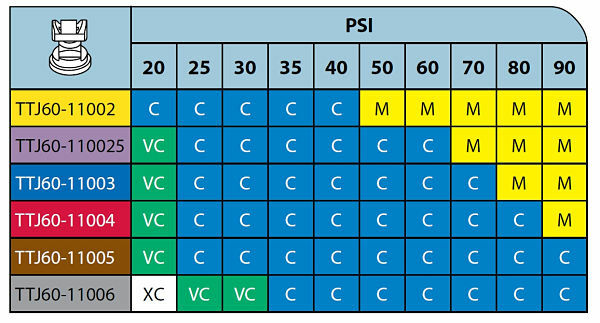 For low pressure nozzles, the speed range tends to be a lot wider. Try to find the lowest possible boom height that also provides 100% overlap nozzle to nozzle. This provides equal coverage across the whole boom width. 5. Operate nozzles at their minimum recommended height. A boom at 50-60 cm (20-24”) above the target will have half the drift of a boom 90-100 cm (36-40”) above the target. Auto-boom height controllers make it possible to lower the boom and maintain the desired travel speed without having to worry about the boom tips hitting the ground. 6. Avoid the combination of extra coarse droplet size and low water volumes. Extra coarse droplets and low water volume will not provide sufficient droplets per square inch to hit every weed with an adequate dose for good control. 7. Use a minimum of 45 L /acre of water unless otherwise specified for the product. 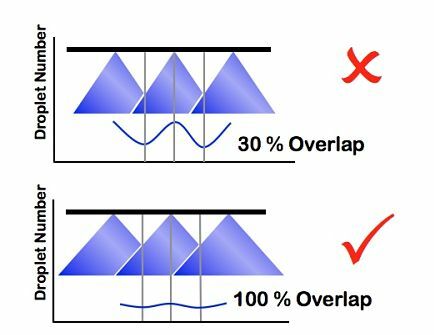 Higher water volumes also help reduce drift since flow ratings (or orifice size) on nozzles have to be greater for a given speed, or speed has to be less for a given nozzle, either of which will reduce the number of fines produced by the sprayer. 8. Ensure that air flow from air assisted sprayers is properly set to minimize airblast rebound and drift. Low drift nozzles, such as venturi nozzles, are better for some products than others. 9. Sprayer shrouds can reduce drift from 35% to 75%. As a result, buffer zone restrictions (set back distances from sprayed areas to sensitive areas or water bodies) are reduced on many product labels when shrouds are used. These tips are from Tom Wolf’s “Spraying tips” webinar, the Guide to Crop Protection “Avoiding Spray Drift” article, and from Clark Brenzil, provincial weed control specialist with the Saskatchewan Ministry of Agriculture. SMA has articles on Choosing the right spray nozzles. 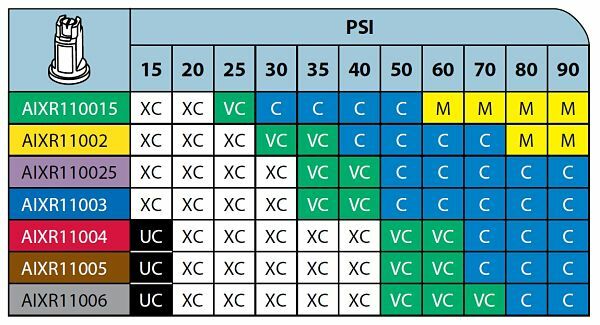 Ideally, you want to choose a nozzle that provides a coarse spray "C" in the middle of its pressure range.